Is UPMC the Place for You? As a Supply Chain Management Summer Associate working in the clinical sourcing department, I’m responsible for sourcing and procuring medical items used to treat patients throughout UPMC. One might ask: why be a Supply Chain Management Summer Associate at UPMC? Personally, I feel that one must be passionate about his or her career choice. For me, my passion stems from helping other people. 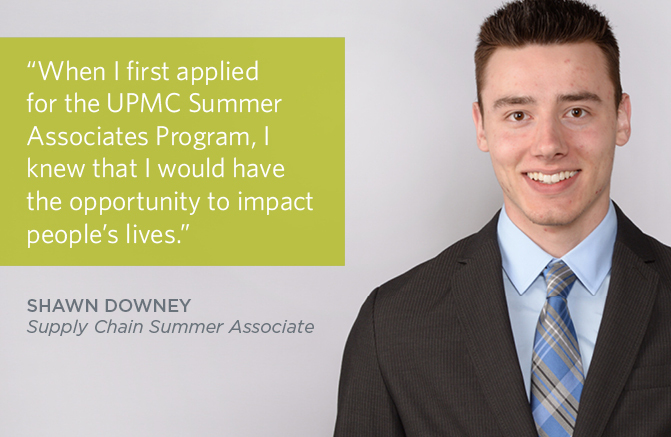 When I first applied for the UPMC Summer Associates Program, I knew that I would have the opportunity to impact people’s lives. I also knew that I could draw upon my educational interests of Supply Chain Management to assist in fulfilling this personal objective. Thus far, I am grateful to have learned the importance of the supply chain in the health care industry. Clinicians heavily rely upon the supply chain to ensure that the proper equipment is present when patients are in need of treatment or care. Having been responsible for purchasing clinical items such as overhead lights for operating rooms, I feel that my tasks made for a very educational and meaningful experience. It should also be mentioned that as a Summer Associate, you get to participate in numerous facility tours and even a surgery observation! A highlight of my summer was witnessing, first-hand, a total knee replacement. These interesting activities become even more worthwhile when you can relate them to the projects you are currently working on. Lastly, if working in the U.S. Steel Tower, you might be lucky enough to get a stellar view of the city from the 59th floor. I would definitely advise anyone who is interested in a Supply Chain Management career path to keep the health care industry in mind. If you like to help others, both set and meet objectives, and have fun, UPMC is the place for you!